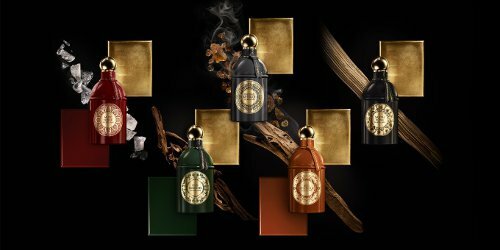 Guerlain has added two fragrances to the limited distribution unisex Les Absolus d’Orient series, Encens Mythique and Bois Mystérieux. Encens Mythique (top center) ~ (probably a reissue of 2012's Encens Mythique d’Orient) "An ethereal frankincense leaves only a fleeting mark on this fragrance, while rose imprints its fiery accents. But the endless sweetness and exceptional depth come from authentic and majestic ambergris of New Zealand, specially selected by Thierry Wasser for this fragrance. An enigmatic opus to sing the praises of a world devoted to eternity. Musky Oriental. Precious, enveloping, endearing." Bois Mystérieux (lower right) ~ (probably a reissue of 2012's Songe d’un Bois d’Eté) "Unique and audacious, Bois Mystérieux, a creation by Thierry Wasser, Perfumer of the Guerlain Maison, is a modern interpretation of the concept of exoticism. Dark is the night... A deep night that only unveils its radiance through its intensity, adorned with touches of cedar, patchouli and myrrh. Leather. Bold, unique, audacious. " Guerlain Encens Mythique and Bois Mystérieux are available in 125 ml Eau de Parfum. I have Encens Mythique d’Orient, so will wear that with a new perspective. It’s a good question…it’s pretty rare that a company claims to use a real animal-derived ingredient anymore. It would be doubly bold to say you’d used real ambergris when you didn’t, but who knows! Hideous bottles in my opinion (although I understand the idea to stay close to the traditional bee). I prefer the previous high glass flacons with those elegant gold elements. That orange bottle is calling me.